Set me as a seal upon thine heart, as a seal upon thine arm: for love is strong as death – Song of Solomon 8-6 – The Bible. Dedicated to Julia, a special friend, as a birthday gift. With thanks to Virtuella and Raksha for editing and to Rachel for permission to use her beautiful artwork. 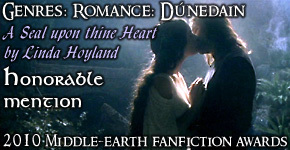 Disclaimer: The characters are the property of the Tolkien estate. This story is written for pleasure, not profit. Arwen gazed transfixed at the man who stood before her beneath the Mallorns. He was still the same and yet so changed. The boy had become a man; and such a man! "My lady." He took her hand and inclined his head. "I did not know you were here." His voice was deeper than she recalled and his tones bore witness of the many lands he must have visited, though his speech was still that of Imladris. "Arwen, would you like to entertain our guest at dinner?" Galadriel said with a smile. "He is one of your father's fosterlings, is he not?" 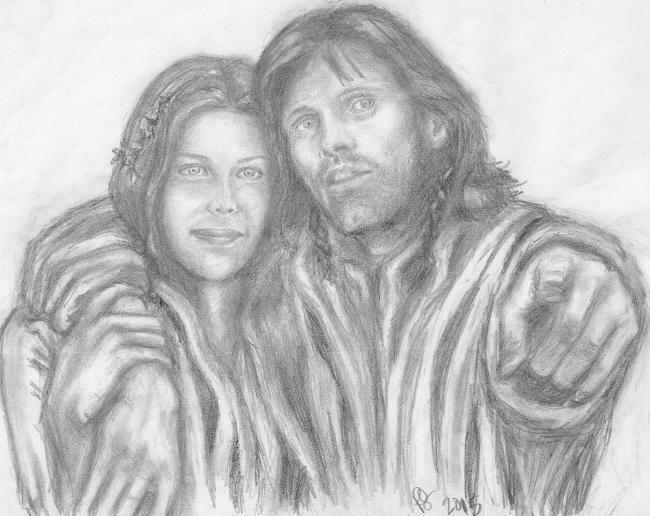 "I did not meet Estel until he came of age," said Arwen. "It was many years ago. I am surprised that he still remembers me." "Who could forget such beauty as yours, my lady?" Aragorn replied. "You are most kind," Arwen inclined her head slightly, and flushed, wondering why a compliment she had heard a thousand times before suddenly affected her so. "Perhaps you will tell us something of your travels?" Galadriel suggested as they sat down at the dining table. Arwen usually found her grandmother's formal dinners rather long drawn out affairs, but tonight the meal seemed to be over in no time as Aragorn entertained them with stories of his adventures in Rohan and Gondor. The tales were light hearted and often amusing as he told of horses pampered like children by the people of the Mark. He then told them about his travels to Gondor and made them laugh with a humorous anecdote about getting lost in the endless corridors of the Steward's dwelling. He spoke too of battles and victories. Arwen sensed, though, that their guest was making light of the hardships he had endured and the part he had played in securing the victories, instead he praised the Rohirrim and the Gondorians for their valour. The next day Galadriel suggested that her granddaughter should show their guest around her realm. Arwen was delighted that Estel seemed to share her delight in the beauty of the Golden Wood. "How could I not love the beauties of nature as I was brought up at Rivendell?" he said. Arwen smiled. "You would be surprised," she said. "I recall one of the heirs of Isildur who thought only of firewood when he beheld a tree. I doubt even these mallorns would have stirred his soul!" Aragorn laughed, his mirth lighting up his face. Arwen thought how fair he was to look upon. The next morning soon after breakfast, Arwen was summoned by her grandmother. "I have some fresh herbs that the healers urgently require," she said. "Could you take them please? My handmaidens are all busy in the weaving rooms." She handed a covered basket to her granddaughter. "I would enjoy the walk," said Arwen, wondering what rare plants her grandmother had been cultivating. The door of the healer's room was ajar and Arwen went straight in, believing that she was expected. The healer was not alone, though, for a man lay upon a bed, his eyes closed, covered only with a towel flung across his hips. It was Aragorn. Arwen knew she should leave immediately to spare the man embarrassment, but she lingered as if compelled by some force outside herself. She had seen mortal men unclothed before during her long life. The sight had only stirred pity within her to behold their frailty and imperfection compared to the Elves. This man, though, was different. His shoulders were broad and well muscled, his belly flat without an ounce of surplus flesh, while his limbs were long and graceful. A few fading bruises marred the beauty of his form. Only a dusting of hair across the broad chest proclaimed him as Man rather than Elf, so Elven-fair was Aragorn. He was somewhat too thin, but a few weeks of good food would quickly restore him to his proper weight. Arwen had a sudden overwhelming urge to gather him in her arms and kiss the bruises. How dare anyone hurt him thus! She wanted to trace her fingers across his chest and feel his muscles ripple against her fingertips. She wanted - she wanted to bear his children! Arwen swayed slightly as sensations she had never known before coursed through her body. She felt herself blushing at her own thoughts. "The treatment has worked well and your scars have faded nicely," the healer told his patient. "I am delighted how well it has succeeded for one of your kind." He turned and saw Arwen. "Oh good, you have brought the comfrey I needed. Thank you, my lady. If you would just place it on the table by the window." Aragon's eyes sprang open and he beheld her. Turning scarlet, he grabbed a blanket and covered himself with it. "My apologies, my lady!" he exclaimed. "It is I who should apologise," said Arwen, averting her eyes as she placed the herbs upon the table. How he contrasted with some of the Elves who had tried to catch her eye, who would have wanted her to gaze at what they considered their perfection while they posed and preened. She hastened from the room. Only later did she wonder why her grandmother had sent her with such a commonplace herb. The healer turned back to Aragorn who now had a blanket pulled up to his chin. "Mortals!" he chuckled. "You can get dressed now. Being schooled in the healing arts yourself, you know that you will need to apply comfrey salve until all your bruises have faded." For the next few days Arwen did her best to avoid the visitor. He had stirred her heart when she had first set eyes upon him many years before and the encounter had haunted her. Never could she have imagined in her wildest dreams that seeing him again would affect her thus! She came face to face with him again three days later as they both walked under the mallorns before the evening meal. "I am sorry that you should have seen me thus the other day," Estel said gravely. "I did not mean to distress you with the sight of one such as I." "I found you most fair." "Fair? How could one as lovely as you find me pleasing to the eye?" He looked at her with longing in his eyes. "My lady, if you would allow me?" Arwen realised that he desired to kiss her, but was holding himself back, fearing to alarm her. She warmed to his consideration; but the man needed to know that she was Peredhel, not some skittish mortal maid barely past childhood! She kissed him. She tasted the sweetness of wholesome herbs on his breath; and more, the very essence of the strongest of Men. After a long kiss they pulled apart "I love you," said Estel. "You are as far above me as Gil Estel, but my heart is yours for the keeping and has been since I first beheld you beneath the birches long ago." "I love you too," Arwen said simply. Oh, but she did; and the power of that love now burned through her body, her very veins, her heart and soul! Overwhelmed, she retreated to the privacy of her chamber. "Your heart is troubled, my child," Galadriel stated as the two of them sat together sewing the next morning. "It is nothing," Arwen mumbled, stabbing her needle into the linen with considerable force. "You forget that I can read your thoughts, granddaughter," said Galadriel. She cut off the thread and secured it, then rose from her seat and went over to join Arwen on the couch. Arwen laid her head upon her grandmother's shoulder. For a while they remained thus in silence. "It is the stranger, is it not?" Galadriel said at last. "You love Aragorn son of Arathorn." "Yes," Arwen's voice was little more than a whisper. "I would cleave to him, but by so doing I will break my father's heart! And what of my mother? She departed for the Blessed Realm, believing our parting would only be for a time." "I know, my little star, I know," said Galadriel, putting her arm around her granddaughter. "There is more to this matter, though, than your parents' feelings, or mine for that matter. I see many things in my mirror. I would not tell you of this if you did not have feelings for Aragorn." "What did you see?" Arwen lifted her head. Her eyes were wide with fear. "The son of Arathorn is a great man, greater than any other Man of this age. Already he has achieved great victories on the field of battle. He is wise too; well versed in lore and a skilled healer. Yet, he could become greater by far and play a large part in defeating the Shadow. Aragorn is but one man, though, and a frail mortal can easily become weary and discouraged, and so lose heart. Were he inspired by your love, there is no limit what heights he might rise to, and what good he might do for all men! Our time here is nearly at an end, but should you become Aragorn's Queen, our people would be remembered, and our lore would not be lost for your children would see that they endured." "So you would not oppose our union?" "I foresee that if you do not wed Aragorn you will remain a maiden until the ending of the world. It would grieve me sorely to lose you, but I would not see you unhappy until the end of time, as you have been these past years." "My heart was stirred when I first beheld Estel beneath the birches many years ago," Arwen admitted. "I knew not why he made such an impression upon me, as he was scarcely more than a boy then." "I do not know what I should do! To wed him would mean that I must accept the gift of Men and follow him I know not where! I am afraid, Grandmother, but I love him so!" Arwen clung desperately to Galadriel in a way she had not done since she was a little girl. "Easy, child. You do not have to decide just yet. Aragorn needs time to recover and will stay with us for a while." "He is not seriously ill?" "Do not look so worried, little star. The healers assure me that he is a strong man who could father healthy children. He has simply pushed himself beyond the limits that even the strongest Man, or even Elf might endure. There is nothing wrong with him that rest and good food will not cure. Now why not suggest to him that you go for a walk? Fresh air is a great healer. Do not worry about the future, simply enjoy the spring sunshine today and show him more of the beauties of Lothlórien." "Thank you, Grandmother. I will think on your words." Arwen embraced Galadriel, then went in search of Estel. Galadriel managed to maintain her composure until her granddaughter was out of earshot. Then she wept bitterly. Was the fate that separated her from her daughter not cruel enough that now she must lose her granddaughter too; and not only for a time, but until Arda was remade? Sometimes she envied mortals; their lives were brief, but so too was their sorrow. In the days that followed Arwen spent a good deal of time with Aragorn. They spoke little of love. Words were no longer needed now they knew what was in each other’s hearts. Instead, she encouraged him to tell of his travels. She learned of the esteem in which he held the Riders of the Mark and loved to hear him speak of their beautiful horses; beasts, which seemed as fine as any that the Elves might breed. Aragorn grieved for the horse he had lost, which further endeared him to Arwen. She loved horses and always treated them with tenderness and concern. Aragorn’s tone grew graver when he spoke of Gondor. It seemed that not only the battles he had fought there lay heavy on his spirits. He spoke warmly of Ecthelion, the kindly, but aging Steward. His son and heir, Denethor, though, was a different matter. “Did no fair lady of Gondor catch you eye?” Arwen enquired with a hint of jealousy. “Since I beheld you, Lady Arwen, all other women have seemed but reflections of the star I held in my heart. I was ever true to you both in body and soul!” Estel declared. Arwen was touched. She had had many admirers throughout her long life, but once they left the refuge of Imladris, they soon forgot her and succumbed to the charms of more easily available ladies. “I would not offend you by going improperly clad,” he replied. Arwen laughed and waded into a small stream, which rippled through the woods. “Join me!” she cried. Estel had no choice but to shed shoes and stockings and join her in the water. Rather to her surprise, despite his long travels, Estel’s feet were long and elegant. From that day forward he rarely wore his shoes when out of doors. As Estel’s strength returned, he would run swiftly as a deer, and then wait for Arwen to catch up. One day she stumbled in her haste and banged her hand against a tree. He caught it between both of his own. She felt the pain ebb away in waves of healing warmth. It seemed that Estel was not only a great warrior, traveller, and master of lore, but also a natural healer. She had felt such power before only in her father’s hands. Time passed; days or weeks, they knew not, for it seemed as if they lived in some beautiful dream. Time passed differently in Elven Realms, or so it seemed to Men. The longest day dawned and Galadriel and her handmaids prepared a feast to celebrate the solstice and honour Arien, Lady of the Sun and Elbereth, Lady Star Kindler, after which they would either watch the stars during the few hours of darkness or slumber beneath them. As soon as the feast was ended, Galadriel and Celeborn danced alone together on the grass watched by the others, as they lightly swirled, as light and graceful as if they were flying. The Lord and Lady then sat down and the other Elves began to dance, all that is; except Aragorn and Arwen. “Come!” She held out her hand. “Would you not prefer to dance with the other maidens?” he asked, still hesitant. “I have done that for many a long year. Now I would be your partner,” she said. Grasping both his hands, she started to dance with him. She was surprised at how well he moved. Granted, not as gracefully as an Elf, but for a Man, he was light footed and nimble. It seemed that he was enjoying himself; his initial reservations overcome. They danced until twilight fell. The Elves could be heard in the distance singing the hymn to Elbereth. Aragorn and Arwen stood beneath the mallorns and joined in. They said nothing more, but simply lay there hand in hand, watching the stars twinkle overhead. There was no sound. It was as if they were the only two awake that night upon Arda. As it grew chill, they huddled closer to each other. Arwen knew then, that this was how she desired to spend every night of her life, nestled beside this man who had stolen her heart. At last Aragorn fell asleep, snoring softly. Arwen was most amused and intrigued at this further evidence that he was no Elf! As dawn broke, Galadriel came in search of her granddaughter. She found her sleeping chastely beside Aragorn. Arwen immediately awoke at her grandmother’s approach. She scrambled to her feet and beckoned that they should walk a little way as not to disturb the sleeper. “Have you no thought for propriety, little star?” Galadriel chided gently. Galadriel enfolded her granddaughter in a close embrace. “Little Star, maybe your doom was decided when the Ainur created their music at the very beginning. We know not the ways of the One. You will know great sorrow from your choice, but I also foresee great joy in your future too. Dry your eyes, little star, for your love will soon awaken.” With a final loving embrace, she turned and descended the hill. “I am yours, Estel, today and forever.” She raised him to his feet. He kissed her and they embraced. At that moment their souls united and they perceived clearly the depth of love in each other’s hearts, two hearts now as one.